Will Increasing Miles Lead to a P.R.? My goal for Chicago’s Shamrock Shuffle this spring is to knock a minute off my time for the 8-K race. I plan to use your Advanced 8-K plan, with its weekly mileage 30-35, close to what I’m already doing as part of my training base. Should I bump the mileage somewhat to help me reach my goal? 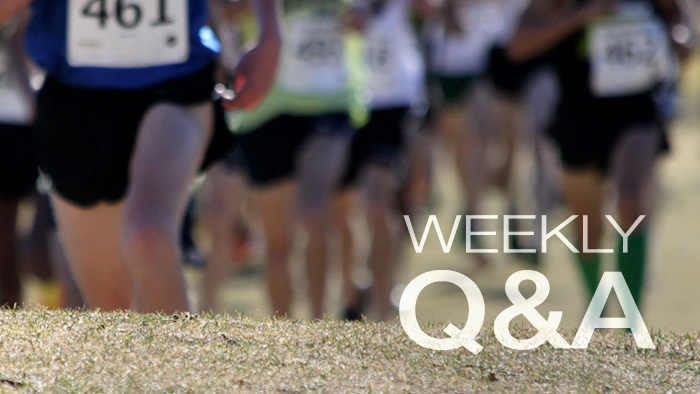 Adding mileage is okay, but only for experienced runners with good mileage bases like you. My Advanced 8-K program lasts eight weeks. As the runner moves from week to week, the program’s difficulty increases, reaching a peak in Week 7, the week before the goal race. Week 8, then, is used for a short taper so the runner reaches the starting line both well trained and rested. But the increase in difficulty comes not from adding more miles. In fact, the mileage build-up is minimal. The increase in difficulty comes from the speedwork inherent in all my advanced programs. In the Advanced 8-k Plan, Tuesdays and Wednesdays in the reserved for speedwork with interval training is done on Tuesday and tempo runs on Wednesdays. Saturday is for pace and Sundays are to run long- although only 8 miles max. Someone like you who was managing 35 miles a week in your base training certainly should be able to bump the mileage somewhat- but only somewhat. You could add a few miles to the “easy” runs on Mondays and Thursdays. Running longer on Sundays also could provide a few miles, getting you up to 45 or even 50 weekly miles. I’m not sure you want to do much more than that.